e carry out on site safety training programs in order to ensure that all employees know and understand all risks present in the facility. We also ensure that they understand and practice all risk control measures and are fully aware of emergency procedures. Our safety training programs are customized as per the client’s process requirements. Nest (National Employment Service and Training) is a leading training institute for Fire and Safety Our trainers are having more than ten years of field experience in industries like petroleum refineries and power plant (nuclear & thermal). The candidates will get both theoretical and practical during the training session. We provide training to Schools, Colleges, Hospitals, Hotels & Different Industries about the use and application of Different type of Fire Equipments installed at their premises. In case, if the necessity comes, how to operate them. The Department of Fire Technology and Safety is established to run a four years full time B. Tech programme for the students who wish to be involved in the design of fire safety solutions through the application of prevailing knowledge and proven techniques. With our Training for Emergency Service our clients will know how to use various fire fighting equipments such as fire alarm, fire extinguishers and emergency exit. We have fully trained workforce who deal with our clients in more respectful manner and they teach all these steps properly till our clients learn them in better manner. Course Duration: 04 hrs. - 08 hrs. 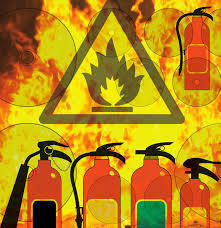 Organizations searching for Fire Safety Trainers, Fire Safety Training Providers in ahmedabad, Gujarat can contact us. Preferred Timing: After 1.00 pm. We are lead service provider of Fire Training Services. Our experts team ensure full safet training programs to tackle various difficult situations. These services are high on demand in the market and they are offered to the customers by qualified professionals.